It's strange to be able to say of a pony "I knew his father well" but I could truthfully say that about our Pepper! 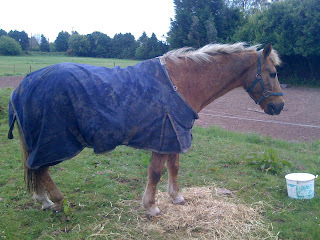 Pepper's father Glen was a 14.2, dark bay, part Connemara pony who had been gelded late, at five years of age. 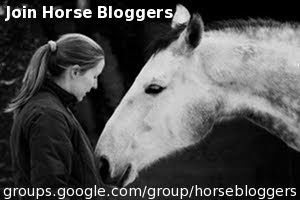 He ended up in the riding school where I trained for my BHSAI and lived out his days there. At first, he was lively and sparky, and only used for working pupils and experienced riders. If you were told you were riding Glen, your heart beat faster and you knew you were in for some exciting moments, especially when jumping! He settled down over the years, eventually becoming one of the stalwarts who knew exactly what to do at every point in every lesson. 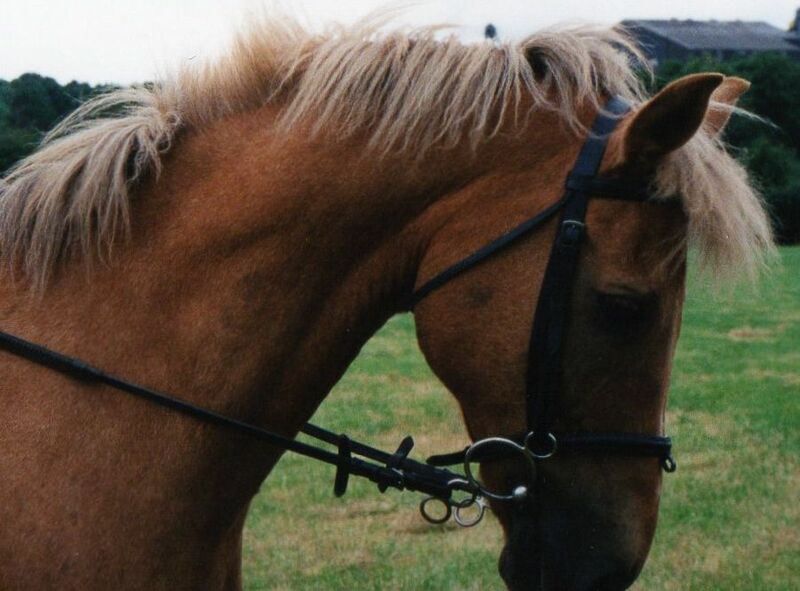 A young girl who lived next door to the riding school and was a regular helper eventually became the proud owner of a handsome palomino gelding, Pepper. To my surprise, I was told he was Glen's son, and indeed when you looked beyond the colour, you could see the same eye, the same shape to the head and a very similar physique - a little long in the back, slightly short in the legs. I wouldn't say I followed Pepper's career, but I was aware of his existence over the next six or seven years. 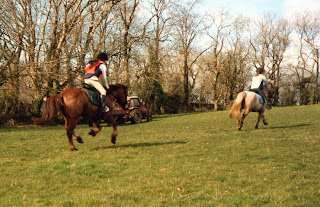 Oddly enough, I have some photos of him attending the St Stephen's Day hunt in 1991 - we went along to follow on foot, and I took pictures of all the riding school gang as they set off. The family who owned him left the area, but a couple of years later Pepper arrived back at the riding school - he had been sold to a young lad who was just ready for his first pony. Well, that was a match made in hell. In recent years, I spoke to other people who had been around as youngsters at the time, and it seems Pepper had always been a little.... shall we say.... opinionated on the ground! If he didn't want to be caught, he'd just keep moving away, and if you persisted in following him, he would charge, teeth bared and hooves flying. Once you finally managed to catch him, you couldn't be sure of holding onto him - he had learned the art of lowering his head and tanking off wherever he wanted to go, ripping the lead rope out of your hands as he went. He was actually very quiet to ride - once you managed to catch him and lead him back to the yard! The boy who now owned him quickly became terrified of him, and although he kept him for a year, he regularly had to be rescued from the manger in the corner of the stable, where Pepper had him trapped. Not knowing any of these minor details, knowing only that this twelve year old pony was quiet to ride and would jump nice and steady around a 1Metre course, when I heard he was for sale I snapped him up. 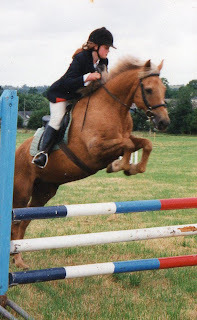 The Eldest Daughter was just twelve and had been riding 12.2 ponies for a couple of years, but she had grown very quickly in the previous six months. We expected that her growth spurt would continue, so there seemed little point in buying a 13.2 for her. She was a gutsy little rider, but always seemed a little less keen than her sister, so a sensible schoolmaster, whose background I knew, seemed heaven-sent. The first I knew of his foibles was when we brought him back to the riding school to meet up with the farrier. I unloaded him and was leading him towards the American barn, his walk got quicker and quicker... two steps of trot and then he was briskly cantering through the sliding door, past the surprised farrier, down the aisle between the stables, heading for the back door and freedom! Much to his surprise, though, I ran with him, and much to my surprise, I was able to haul him around just before he went through the back door. He won't try that again, everyone said. Ha! It was his party piece, he wasn't going to give it up! In the end, we always led him either in a bridle or with the lead-rope twisted through his noseband - he never tried to bolt once he knew you'd have the upper hand. He demonstrated his other party piece a short while later. He had jumped out of his paddock (another little trick of his) and was grazing in the front garden. Armed with head-collar and lead-rope, I went off to catch him. He watched me coming, I watched him watching me.... then his ears went flat back against his head and he charged straight at me, mouth open and front feet flying out as far they could. I think I went a little nuts, because I held my ground, side-stepped like a matador at the last minute and WALLOPED him across the neck with the head-collar. Shocked, he trotted off towards the yard - I don't think anyone had ever stood up to him before, and indeed he never charged at me again, although he did it occasionally with other people over the years. I followed him, herded him into the arena and spent about half an hour working on join-up, until he was willing to stand while I approached and then follow me for a few steps. That became our modus operandi. I ended up with a strand of wire ready in the paddock so that if he was difficult to catch, I could easily partition off a small section and loose school him until he was ready to give in. He quickly learned that being difficult to catch=getting extra work, whereas being easy to catch usually meant a handful of nuts, and eventually he was fairly dependable, with family members anyway. Apart from these quirks, he was a really great pony. The ED had three happy years with him and I even got to bring him along to a couple of Riding Club jumping competitions myself. Once you kept him in his comfort zone, he would jump clear rounds all day long, but once the fences went past one metre, he began to struggle. Ask him to jump a 1.20 course and the answer would be a flat "NO!" The problem with this, though, was that at the time, ponies were graded A,B,C and D. Every time a grade C or D pony jumped a double clear, it collected points, and once it had so many points, it had to move up a grade. Once they got to grade B, the courses were suddenly much bigger and much more technical - too much for Pepper. In their first ever ABC competition, Pepper and the ED had one of those lovely "connecting" moments. The ED was walking the course - the biggest they had ever jumped, with fence heights somewhere around 1.10 - 1.15M. I was in the pocket, holding Pepper,when I realised that he was watching her every step - in fact, I think he was learning the course too! Pepper absolutely rose to the occasion, and despite the ED's nerves, they jumped clear in the first round - it was as if he was saying "It's ok, I know what I'm doing!" He willingly upped the pace in the jump-off, they took a couple of tight turns and literally flew around, producing the winning round. Tears in her eyes, the ED said "Mum, we are never selling this pony!" and fool that I am, that's why he's still with us. He was the safe pony that you could put any visiting child up on, but at the same time he would go up a gear with a more experienced rider. He was super-safe at hunter trials - he would gallop on in the open spaces, and then collect himself up and pop the fences out of a show-jumping canter. He was just plain scarey out hunting, he would grab the bit between his teeth and go at a flat out gallop, jumping anything that came his way - banks, drains, gates... whatever. After six years with us, the ED had lost all interest in horses, the YD's goals were higher than Pepper's abilities and he was languishing in the field most of the time. This was when I should have sold him, he'd have been perfect for low-level Pony Clubbing, but I didn't - I loaned him to a friend who was just starting up a riding school. After a year, my friend offered to buy him, but I refused, I felt honour-bound to remain responsible for Pepper, and see him through his vintage years. He stayed in the riding school for about five years, and was retired for the last of those, spending his days as nanny to a bunch of youngsters. The following year, though, the winter was long, hay was scarce and expensive, and my friend rang me to say he'd have to send him home. 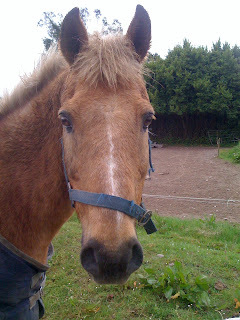 Pepper arrived back in 2010, somewhat arthritic in his left knee and with borderline laminitis. His feet were in a shocking state - they had clearly been left to grow way too long, before someone had literally just chopped the toes off, leaving his sole untouched and slightly convex and the wall unrasped afterwards. My "friend" blustered his way through my queries, saying oh yes, his feet were a bit long, they'd been waiting for the farrier who had finally called the previous day... I don't think any farrier would have left a pony's feet in that condition! 'Nuff said, I vowed never to loan a horse again (you'd think I'd learn, wouldn't you, Aero went off on loan six months later!) and got my farrier in to look after the feet. Pepper is "hangin' in there" at the age of twenty-six. His feet have a wonderful ability to grow vigourously in a completely wrong way, so he's always a worry at this time of year. I suspect his vision may be going, as he seems to peer at me very strangely whenever I approach him. He's reasonably sound on good going, and is generally content with life. He poses quite a problem for me. I need to find him a good home as an unrideable companion before I leave in October. I'm praying it works out, otherwise I will have to face the reality that if I cannot be sure he'll be looked after in my absence, I will have to arrange a quiet end for him in our paddock. I would rather do that than take the chance that he would end his days neglected, miserable and in pain.